He was enthralled with the classic yachts and stacks of reference material. The Silver Covenant Chain on display for all to see. Friendship. Peace. Respect. This wasn’t just a chain. I located the Executive Director, Paul Adamthwaite, and asked about the significance. Forty-five minutes and many topic tangents later I was even more captivated by it. Today, I was told, the Silver Chain is taken to schools were it is polished. The response by the students has been gratifying. They see the necessity of polishing Friendship, Peace, and Respect. They welcome it into their school life. In 2011 I ask you to reflect on this symbolism of 1677. It’s more than establishing an atmosphere of Friendship, Peace, and Respect. It’s maintaining it, polishing it, as it insidiously tarnishes. Paul was right in saying it’s not about one person, but it does start with each of us. p.s. 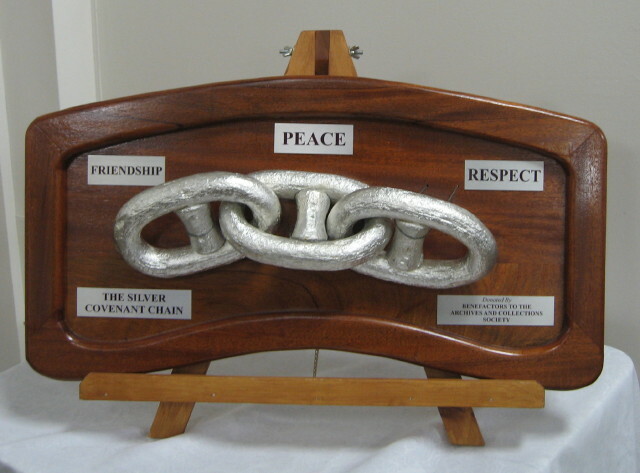 The next time you’re touring the wineries of Prince Edward County pop into The Archives and Collections Society to see the Silver Covenant Chain. Paul is overflowing with information! This entry was posted in Commentary and tagged civility, etiquette, friendship, peace, Protocol School of Ottawa, respect, Silver Covenant Chain, Suzanne Nourse. Bookmark the permalink.